Hominidae, consisting of chimpanzees, gorillas, orangutans and humans. 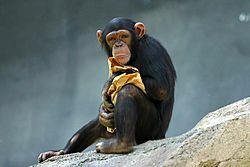 One clear difference between monkeys and apes is that monkeys almost always have tails, but hominoids never do. There are also differences in their teeth and the way they move their arms. 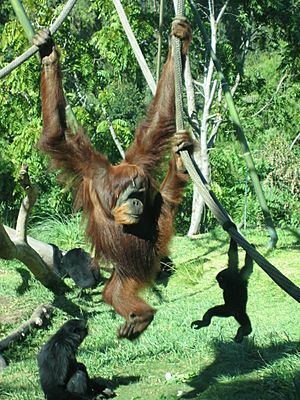 They have a wide degree of freedom at the shoulder joint, which helps them swing by their arms in the trees (brachiation). The diets of apes are similar to those of other primates. They eat fruits, nuts, seeds, leaves and sometimes other animals. They are omnivores, though most of their intake is herbivorous. Ape Facts for Kids. Kiddle Encyclopedia.